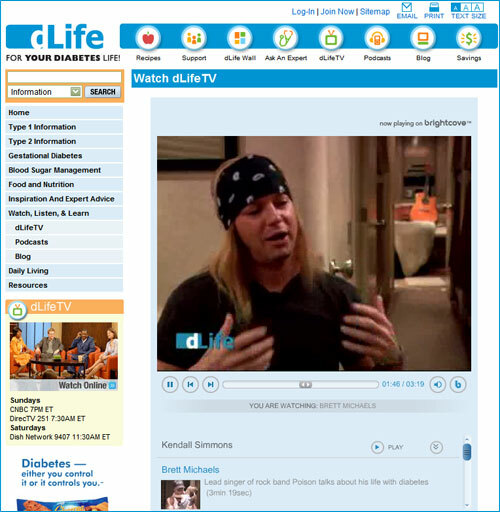 I never knew that Bret Michaels from Poison (not that I often think about Michaels or Poison) had diabetes, or that he was remotely this articulate. With high-quality educational video, and profiles such as Bret's and this young Pittsburgh Steelers star, dLife puts a human face on diabetes. dLife exemplifies why Internet TV, marrying the quality of television programming with the search/share/bookmark capabilities of the web, is inherently more powerful than linear, one-way TV. It's easer for dLife's target audience to find and watch this constant, always-on and always-on-demand experience. dLife's video programming serves as a backbone to a rich, interactive environment that weaves together community, photos and text-based information of all kinds. It's a template for how to bring an Internet TV channel to life, something that non-profits, educators and storytellers of all kinds would do well to mimic.